The rubber part of the driveshaft assembly / CV Axle is known as the CV boot, which is secured with stainless steel clamps. We call it cv boot clamp. 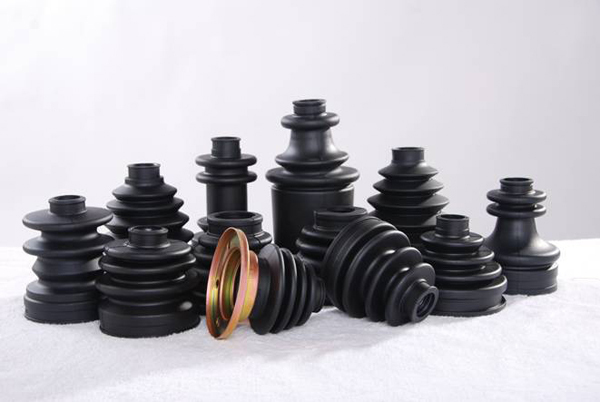 The purpose of CV boot is to protect the internal components of the CV joint by retaining the lubricant, and also acting as a dust shied. CV boots have different shapes and sizes. The bellows on the boot determine the amount of movement the boot tolerates. The type of boot to be used depends on the CV joint type; boots either have locking lips or they are plain on the retaining profile. Most problems with CV joint is due to the CV boot getting broken, and the lubricant leaking out and getting dried, so inspect the cv joint boot and the lubricant periodically. How to replace CV Boot? 2 Comments to "CV Boot"
I need a replacement boot for the outer end of a CV joint axel whose manufacturer no longer makes them. large end diameter 85mm/ 3 3/8ths inches. smaller end diameter 24mm/15/16ths inches. Length 4.75-5.5 inches would work.